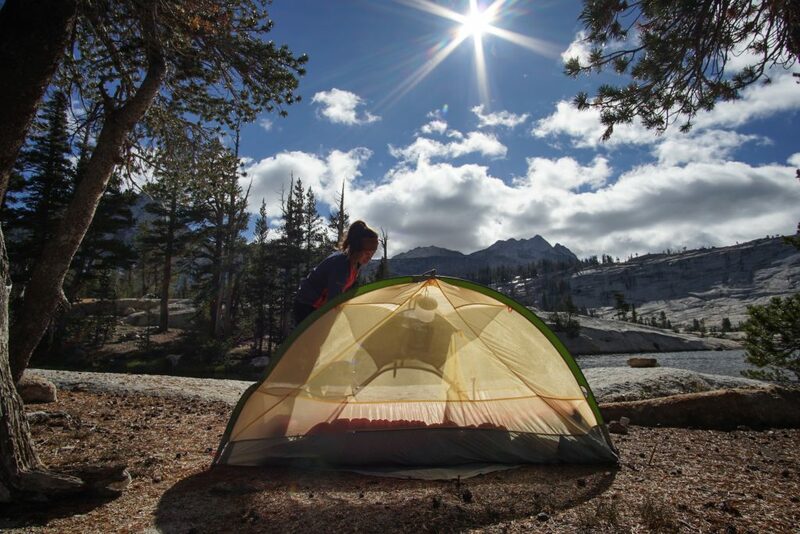 The Mira 1 HL, an ultralight 3-season tent, faced high winds in the Enchantments, unanticipated snow in the Sierras, and a high alpine night on Mount Adams. It passed each test with flying colors and has become my go-to shelter for backcountry adventures. Growing up venturing into the wilderness and through years of backcountry guiding, I tend towards sleeping under the stars and using tarp shelters in inclement weather. For a tent to make it into my pack, it needs to be lightweight, quick to setup, and sturdy. Since receiving the Mira 1 HL, it has become my shelter of choice. Weighing a max of 2.6lb and claiming only 16.5in x 4.7in of your pack, this tent offers a perfect lightweight option and admittedly, is turning me into a tent-loving person. If you are eager to shed further weight, the rain fly can connect directly to the footprint to create a lightweight shelter without the actual tent body. On a recent climb up Mount Adams, I discovered that this setup has the ability to shelter two people if needed (though the footprint really only supports one person). The footprint does not come with the tent, but I recommend buying it to increase the longevity of the tent as well as provide the fly-footprint option. When I received the tent and felt its weight and material, my first concern was durability. In the Yosemite high country, I woke up at 1am to headlamps flashing outside and a friend asking me for duct tape. Their tent pole had snapped under the snow. When I hopped out to help, I noticed my tent was standing strong. On a recent trip in the Enchantments, it faced another storm with gusts of wind up to 50 mph and remained untouched. Most impressively, it has survived my packing technique, which involves stuffing the tent parts into air pockets in my bag. The tent is constructed of one long pole that makes up the spine and two cross poles that help create some width and stability. Technically, it is a stand-alone tent, but the design is far more effective when fully staked out. This construction offers plenty of upright room for sitting, but does create fairly steep walls. The upper cross pole extends sufficiently away from the canopy, which makes it easier to get in and out of the tent or cook under the vestibule on a rainy day. The canopy offers 16.1 ft2 of living space while the vestibules add an additional 7.5 ft2 of gear storage—part of which is located in the rear vestibule with zipper access and has become my favorite place for wet rain gear and my water bottle! Exped has fine-tuned many other features on the Mira 1 HL to allow a quick and simple setup. 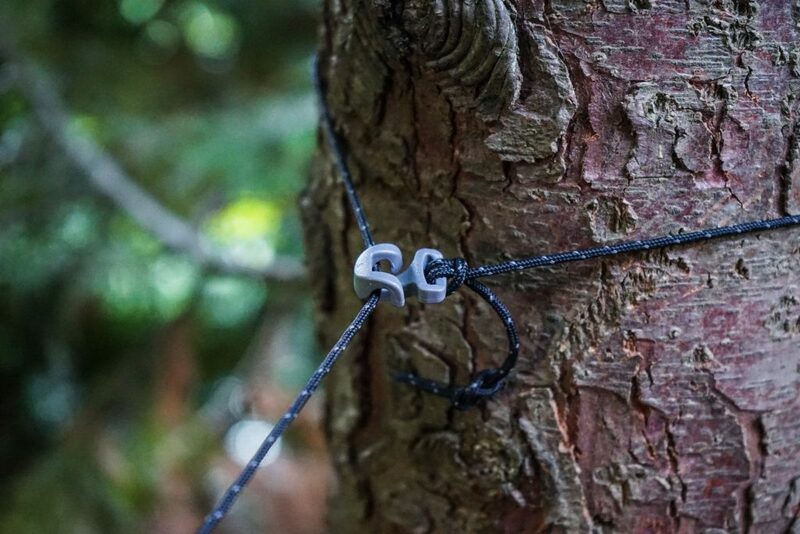 The guylines are equipped with smart hooks and a sliding mechanism for speedy securing and tightening. The buckles on the footprint, canopy, and fly are all color-coded, which also helps provide a smooth setup. The rain fly contains stiff webbing, which helps keep the doors apart for increased ventilation. Alternatively, if you want to pull back the fly door for the day, it easily secures to a hook on the spine of the tent. Boasting a beautiful yellow and green combination, this tent definitely fit the “attractive bill” for me. The canopy is largely mesh, which allows for stargazing, good ventilation, and great bug protection on warm nights. Inside, the tent has loops for hanging lights as well as a mesh pocket for other easy-access storage. The tent comes in a duffle like sack with two compartments. This is very convenient for keeping a wet rainfly away from the canopy, but isn’t the most compact carrying device. Anyone who has been backpacking knows that weight is in constant battle with durability and comfort. The Mira 1 HL has done a great job of balancing these factors so that the tent is virtually imperceptible in the pack, but a lifesaver in the elements. 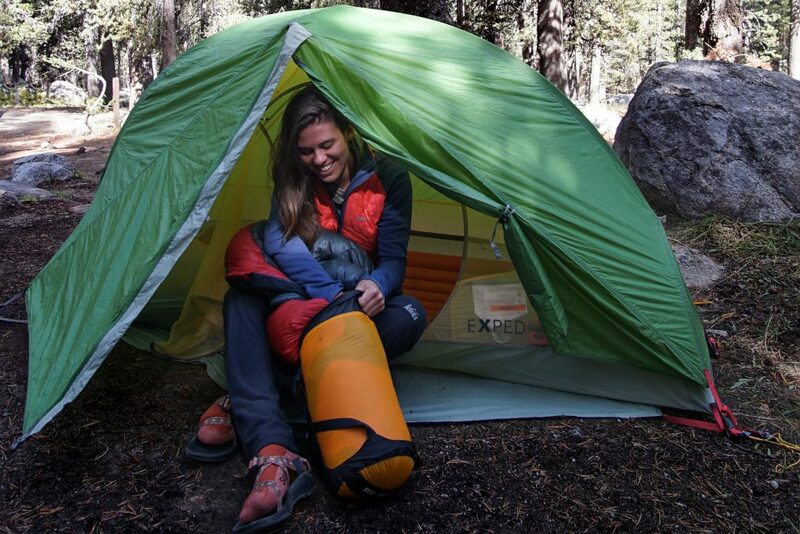 Shop the Exped Mira 1 HL on Outdoor Prolink. Not a member? Apply today! Isabelle Chatroux grew up playing in the backcountry with her family and has since gone on to guide summer backpacking trips for 4 years in Colorado and Yosemite National Park. In the winter, she guides trips outside the Portland, Oregon area including snowshoeing, backcountry skiing, and snow camping. When she is not guiding, you can find her climbing, mountaineering, skiing, or adventuring camera in-hand!